CPO, Limited 4wd, Blind Spot monitoring, Bluetooth / Handfree Cellphone, Rearview Camera, USB Port, Heated Seats, Remote Start, Bought, Serviced, and Traded at Videon, 4WD, 8.4 Touchscreen Display, Navigation ready, Auto-Dimming Exterior Passenger Mirror, Automatic temperature control, Blind Spot & Cross Path Detection, High Pressure Tires Tracking, Integrated Voice Command w/Bluetooth, Power Liftgate, Premium Leather Trimmed Bucket Seats, Quick Order Package 23H, Radio: Uconnect 8.4, Rear-View Auto-Dimming Mirror w/Microphone, SIRIUSXM Satellite Radio, Steering wheel mounted audio controls. CARFAX One-Owner. Deep Cherry Red Crystal Pearlcoat Recent Arrival! 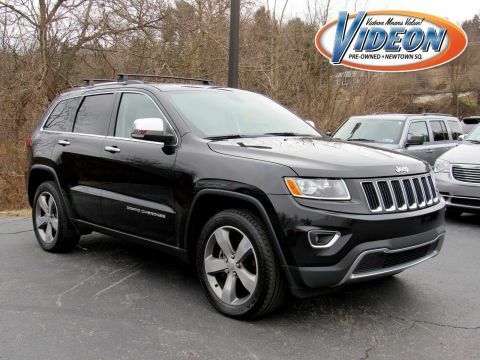 Odometer is 11504 miles below market average!This beautiful Grand Cherokee has now been factory Certified and is covered by a Jeep 100k mile warranty! 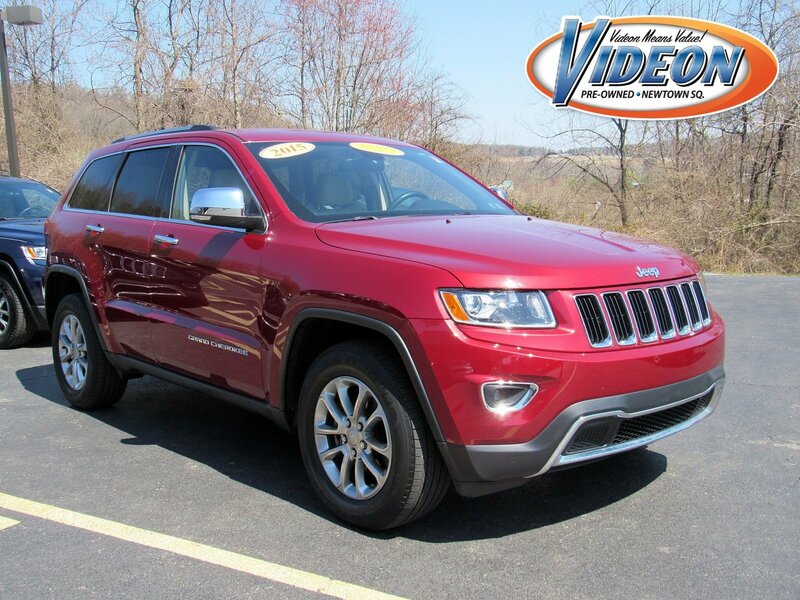 !2015 Jeep Grand Cherokee Limited Limited 4WD 8-Speed Automatic 3.6L V6 24V VVTAwards:* Green Car Journal 2015 Green SUV of the YearBased on 2017 EPA mileage ratings. Use for comparison purposes only. 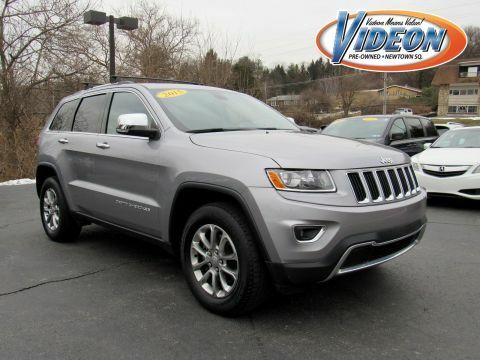 Your mileage will vary depending on how you drive and maintain your vehicle, driving conditions and other factors.Reviews:* The Jeep Grand Cherokee SUV comes closest to having it all: a high-tech and comfortable 5-passenger interior, genuine off-road capability and an array of engine choices. If you take the road less traveled, this is your ride. Source: KBB.com* Strong and fuel-efficient engine lineup, including diesel V6; upscale interior; plenty of luxury and technology-oriented features; irrefutable off-road ability; outlandish SRT model. 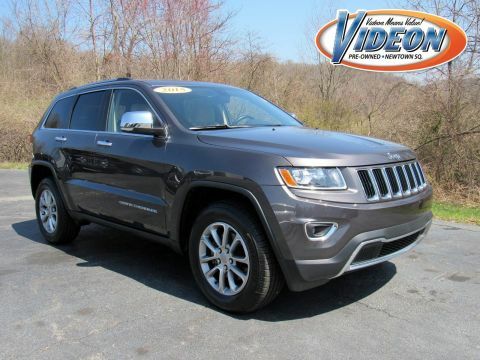 Source: Edmunds* The 2015 Jeep Grand Cherokee is making praises and setting standards for performance, Best-in-Class Highway Fuel Economy, and precision. A confident and elegant exterior design exudes strength from every angle. Every Grand Cherokee from Laredo to Summit features premium styling treatments including new, modern front grille and fascia treatments, daytime running headlamps, projector fog lamps and capless fuel fillers. The rear of the Grand Cherokee offers large taillamps with signature LED lighting, a large rear aerodynamic spoiler with a sculpted tailgate. Available premium-quality Natura Plus leather is soft and supple with outstanding breathability. Adding to the luxury and comfort are heated/ventilated front seats and heated rear seats. The rear cargo area in the 2015 Grand Cherokee lets you configure up to 68.3 cubic feet of storage when the rear seat is folded down. 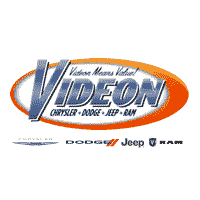 Choose from 3 different engines including the new 3.0L EcoDiesel V6 which can attain up to 30hwy mpg, drive up to 730 miles on one tank and tow up to 7,400lbs. The 3.6L V6 engine features new eight-speed automatic transmission, with paddle-shift steering wheel controls and the new Eco Mode improves fuel efficiency by 9% and tows up to 6,200lbs. Finally, the 5.7L V8 engine with Fuel Saving Technology boasts 360hp and 390lb-ft of torque and provides a Best-in-Class 7,400lbs towing capacity. Inside the newly updated Uconnect System features a massive 8.4-inch touchscreen, Full-Feature Navigation, SiriusXM Travel Link/SiriusXM Traffic and HD Radio. Enjoy music on 1 of the 3 available speaker systems including the top of the line Harman Kardon 19 speaker system. Source: The Manufacturer SummaryFamily owned and operated for over 60 years now!150 point inspection.